As a follow up to a recent post about how the bond market is worrying about inflation, I post these charts. 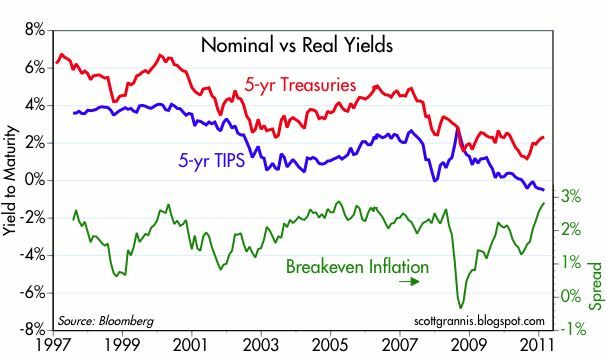 The top chart shows the relationship between 5-yr TIPS and 5-yr Treasuries, with the spread between their real yields (which equates to the market's expectation for the what the CPI will average over the next 5 years) now within a few bps of an all-time high (2.85%). The second chart does the same for 10-yr maturities, and the spread there has now reached 2.63%, which is also very close to its highest level since 2005. 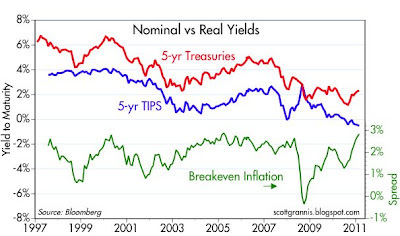 The message of both charts is the same: inflation expectations are rising significantly. Fed supporters would be quick to note that this could just be a rational reaction to the recent and continuing rise in oil prices. But Fed critics have more ammunition: the very weak dollar, the broad-based rise in commodity prices, the all-time highs in precious metals, and the substantial rise observed to date in the producer price indices and the ISM prices paid indices. There is no shortage of evidence that monetary policy is extremely accommodative and inflation pressures are building. The last refuge of the inflation doves (the Phillips Curve theory of inflation) is being dismantled almost daily, as prices all over the world rise even as there remains plenty of slack in the U.S. economy. To his credit, Dallas Fed President Richard Fisher today sounded a pretty strident inflation alarm: "Inflationary impulses are gaining ground in the rest of the world ... this will result in some unpleasant general price inflation numbers in the next few reporting periods ... there is the risk that we might breach our duty to hold inflation at bay." I think it is now clear that the Fed has way overstayed its welcome with QE2, and I find it hard to believe that the rest of the Fed governors will ignore the mounting evidence of such. The ECB has already made the first move to tighten, and meanwhile the figurative rats are abandoning the sinking USS dollar (see my prior post on Brasil). QE2 is scheduled to finish in a few months, but if it is abandoned now it will hardly be cause for concern, since the remaining Treasuries to be bought represent only a very tiny fraction of the total outstanding, and thus are very unlikely to make much of a difference to yields and/or the economy. What will make a difference, of course, is a Fed decision to ignore the evidence of rising inflationary pressures. I am not trying to be snotty--am I reading these charts correctly? Expected inflation over the next 10 years is at 1 percent? After being negative in 2009 (a situation leading to deflation, the results of which are quite dire; see Japan). Am I supposed to be alarmed about an anticipated 1 percent inflation rate? Has Richard Fisher looked at these charts, or did he just drive by a gasoline station? If the market really expects a 1 percent inflation rate over the next 10 years, I would say we need to raise expectations up to 2 percent, the target rate (or three percent, if the CPI actually overstates inflation, as some say). Really, with real estate soggy, and unemployment near 9 percent, and anticipated inflation at 1 percent for the next 10 years, I think Bernanke needs to do more, not less. I just cannot fathom the current extreme sensitivity about inflation. What am I missing? You are not reading the charts correctly. Expected inflation over the next 5 years is about 2.9% per year, and over the next 10 years is about 2.7% per year. Both of these expectations exceed the historical average inflation rate over the past 10 (2.4%) and 20 (2.5%) years. Still, the general trend on these charts, all through the 2000s, seems to be down, with a slight hiccup now--and now is when one would want a hiccup, to get us out of recession-deflation. Thanks for answering my question. And I better wear my reading glasses. appropriate...love to know your opinion. If I were Bernanke, I would start out by announcing clearly my objectives, which would be to safeguard the purchasing power of the dollar. I would point to the importance of market signals (e.g., commodities, gold, the yield curve, the value of the dollar, TIPS spreads) as guides to policy decisions. 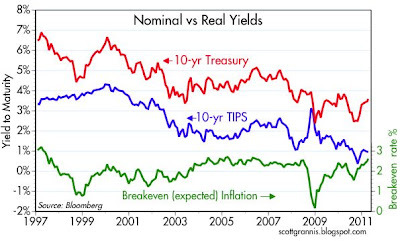 I would reject the Phillips Curve theory of inflation. Then I might start the bidding by raising the funds rate target to at least 1-1.5%, but I would make it clear that there would be no "gradualist" approach. I would want to raise rates until the market signaled that I had done enough.